Derbyshire Healthcare NHS FT (DHFT) have teamed up with Chesterfield Royal Hospital NHS FT (CHFT) to improve services for patients with a substance misuse need following a report issued by Healthwatch Derbyshire. Derbyshire Healthcare NHS FT has teamed up with Chesterfield Royal Hospital NHS FT to improve services for patients with a substance misuse need following and recommendations by patient watchdog Healthwatch Derbyshire. A number of issues were flagged up with the report concluding that more needed to be done to support people in Derbyshire who faced drug and alcohol misuse issues. The two health providers have therefore developed various initiatives to increase staff awareness and training of the problems facing people with substance misuse issues and to ensure they are provided with better access to services. 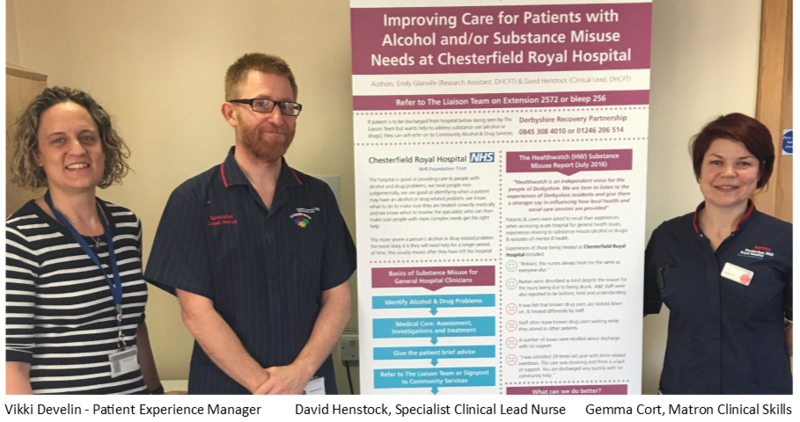 David Henstock, Specialist Clinical Lead Nurse in the Derbyshire Healthcare Liaison Team, working within Chesterfield Hospital, said: “The Healthwatch Derbyshire report into the experience of people with substance misuse problems was very welcome. “It helped to highlight the good work that hospitals do whilst also helping us to reflect on how we could be better still. “Thanks to the forward thinking of Chesterfield Royal and their collaboration with the Derbyshire Healthcare Liaison Team, we have been able to use the learning from this report to ensure we continually improve our services. “In response to the Healthwatch report we worked via the Professional Education Group of Chesterfield Royal to design an educational programme for the workforce to help them to build their knowledge skills and confidence to interact positively with this important patient group. “This includes an awareness poster and a series of classroom-based educational sessions. “We have also developed a session called “Making Every Contact Count for the Hospitalised Substance User” which has so far received excellent feedback. “This session seeks to address head–on such issues as stigma and prejudice. It also gives the hospital’s workforce evidence–based skills that increase the likelihood that our patients can change their alcohol or drug use behaviour and as a consequence avoid future ill health and need for hospitalisation.